If media reports are to be believed, the new models in the carmakers’ line-ups won’t be mere badge-engineered versions of their donor products, rather, in all likelihood, they will sport a revamped avatar. ‘Soft parts’ like the bumpers, grille, and lights are expected to be different, to ensure a distinct visual identity to each model. Sheet metal changes are unlikely since they incur heavy costs. As far as the engine is concerned, however, the Maruti and Toyota models will be identical and will share engines and gearboxes. In due course of time, the models are also expected to adopt some form of hybridization in line with Suzuki and Toyota’s partnership in this area. The product sharing will assist in plugging a major gap in Toyota’s line-up. The Vitara Brezza-based model and Baleno-based models will give Toyota a much-needed presence in the hugely popular compact SUV and premium hatchback segments. On the other hand, the Corolla-based sedan, will facilitate Maruti in the expansion of its line-up and give the carmaker a premium offering, which could be retailed from the Nexa sales network. Apparently, the product-sharing agreement is a win-win for both manufacturers. 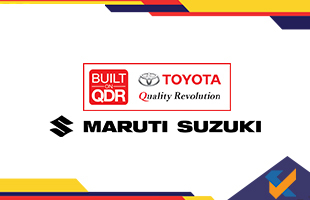 Suzuki an Toyota has been exploring ways to partner in India since February 2016, and in November 2017, had announced a Memorandum of Understanding with the aim to lay the foundation of a joint strategy. The strategy was intended to introduce battery electric vehicles in the country in 2020. Technology and products aside, the two Japanese carmakers are also looking at other areas of cooperation.